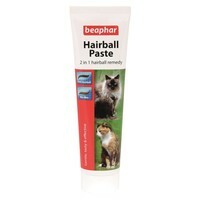 Beaphar 2 in 1 Hairball Paste is a completely unique dual action remedy for cats that suffer with hairball problems. This fantastic paste helps to ease the passage of the hairballs through the cat taking away any discomfort, while also providing a rich source of natural prebiotics that support and maintain a digestive system. With a tasty flavour that cats simply cannot resist, the Beaphar 2 in 1 Hairball Paste is the perfect way to deal with those annoying hairball issues. I'm afraid my 2 cats backed away each time I tried to give them this. I'm lucky because they're not normally fuss-pots and happily tuck into their beaphar top 10 cat vitamins & calming tablets, but this paste had them literally recoiling moonwalker-style. It's very malty & as one of mine it's a Marmite fiend I would have thought this would be right up her street. I am giving 2 stars as it it's easy to dispense and in sound packaging, but definitely not at all palatable for my two. (I tried wiping it on a paw but it's very sticky & thick so I ended up with fur covered werewolf looking fingers and cats with (temporarily) stained paws ). Great product which my cats love. Useful as a reward/treat when giving medications, as well as a supplement to help combat hairballs. Both of my kitties love this - they eat it straight from the tube as a treat and it really has helped reduce the number of hairballs they vomit up. a very good alternative for the over priced katalax (by manufacturers NOT vet uk) it has a lovely thick concistancy which doesn't seperate which makes it easy to squirt a ball of it onto my finger and administer onto the back of cats tounge like a tablet. no waste at all.